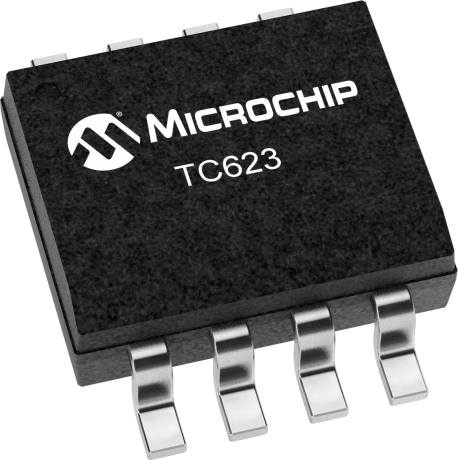 TC623 is a 3V solid-state, programmable temperature sensor designed for use in thermal management applications. It features dual thermal interrupt outputs (LOW LIMIT and HIGH LIMIT) each of which program with a single external resistor. The HIGH LIMIT and LOW LIMIT outputs are driven active (high) when measured temperature equals the user-programmed limits. The CONTROL output is driven active (high) when temperature equals the HIGH LIMIT setpoint, and turned off when temperature falls below the LOW LIMIT setpoint. The CONTROL output can be used to provide simple ON/OFF control to a cooling fan if so desired. Low voltage operation, easy setpoint programming, small size and low cost make the TC623 an ideal choice for many thermal management applications.